Anyone who has ever been fishing knows there can be a tremendous amount of down time. Telling stories and spending time with friends and family on the water was always part of the joys of fishing for Ronnie Green, who’s been casting bait all his life. After a successful career in the medical device industry and a lifelong love of bass fishing in particular, Green has taken his experiences to the television screen as the host of A Fishing Story with Ronnie Green on the World Fishing Network, showing that catching fish is more than surface deep. 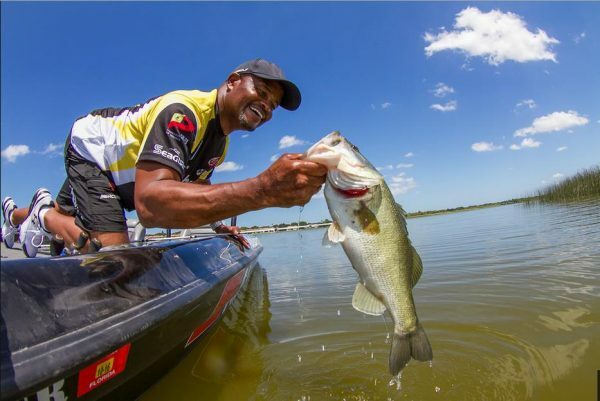 It’s not just the fishing, which is phenomenal by the way — everything from bass to scallops in and around Florida — which makes Green’s show such a hit with viewers. It’s also the stories that people tell. It’s the depth the host takes in getting to know his guests. It’s about relating to people and understanding their point of view, and fishing is just the backdrop. Green, who was raised in Texas the son of an “interventionalist” and “un-traditional” pastor, is a natural in the role. We spoke to the father, Marine Corps veteran and former All-American track star from his home in Tampa Bay, Florida. He said he’d watched a lot of fishing shows over the years, but there was something missing. Having completed the show’s third season with new episodes set to air in January, Green said the concept is working exceptionally well, what he calls “Oprah Winfrey deep.” Guests have revealed incredibly personal experiences such as the pain and trauma caused to a son witnessing his father kill his mother. It helps people to realize that there is so much more to life than the daily grind and to take the time to spend some quality time with one another. Growing up in Texas it was Green’s great-grandmother who first opened his eyes to the power of fishing. She would take him fishing for bass and catfish at the age of three, he said. Later as a father, fishing became a way to build stronger connections with his kids. At a time in their teenage years when all they wanted to do was go to the mall, Green said he used fishing as a way to glean information. The fishing on Green’s show is pretty spectacular too. A world class bass fisherman, Green takes viewers to the freshwater lakes and saltwater environments of Florida and around the gulf, having recently shot an exciting episode fishing for shallow water grouper and another diving for sea scallops. How Green landed a job as the television host of a weekly fishing show was somewhat happenstance. He had been speaking at sales conventions when a man who worked as a television producer recognized him from a local bass tournament. So he sent him a demo tape and the rest is history. Finally to end our conversation, we asked Green what it was about fishing that he thought really opened people up. Catch A Fishing Story with Ronnie Green every Saturday morning 9:30 AM EST on World Fishing Network. Follow Ronnie on Facebook here.